During my first report for the Chevy STL Keys promotion (more about that soon! ), I decided to do a formal review on one of the most unique chicken wing eateries I’ve yet to come across, and I’m fortunate enough to have learned that it was located in the St. Louis, Missouri metro area where I call home. I’m referring to St. Louis Wing Company, the brainchild of Chef Bobby Tessler. Instead of featuring multiple level heat sauces (you’ll find monikers such as no mild, medium, hot, and nuclear) like some wing joints or differently-flavored bottled sauces such as Buffalo Wild Wings, Chef Bobby takes a different approach. He whips up created-fresh-from-scratch sauces, glazes and marinades and will also apply herbs, spices and chopped and minced solid ingredients atop the already “tossed” wing pieces. 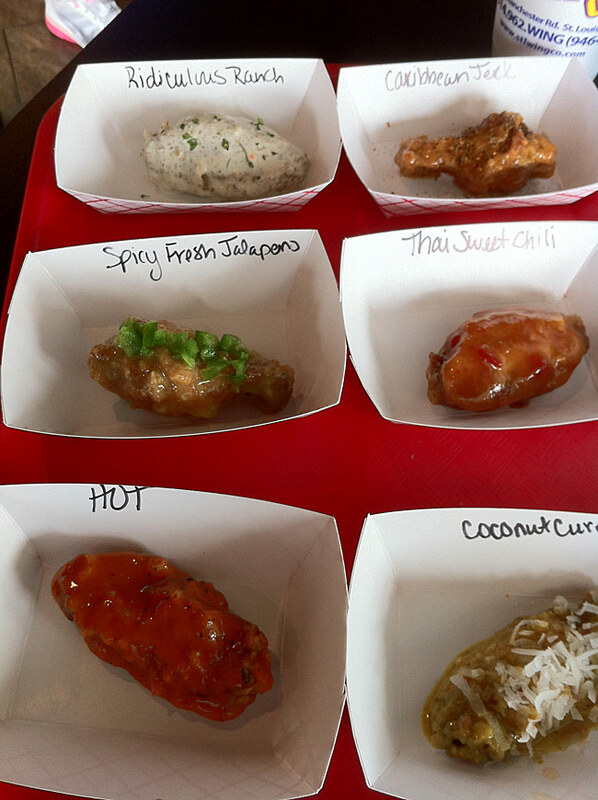 The results are some of the most unique and creative gourmet styles of wings you may have ever come across, especially if all you’re used to are mostly buffalo wings from your local pizza parlor that only differ by various heat levels. Chef Bobby is a trained culinary craftsman who worked as an Executive Chef at a handful of restaurants before deciding to made the jump into entrepreneurship by opening his one-of-a-kind wing eating house. As he told me, he loves comfort food in general and chicken wings specifically, so why not use that avenue to invent some really crazy concoctions?Copyright 2011 ScottRobertsWeb.com.